This event took place in Musanze on Sunday, March 05, 2017. Several high personalities of the Church and the State were present at this celebration. During his speech, Prime Minister Murekezi urged clerics to ensure the welfare of their flock. “I am the good shepherd. The good shepherd gives His life for the sheep. But a hireling, he who is not the shepherd, one who does not own the sheep, sees the wolf coming and leaves the sheep and flees; and the wolf catches the sheep and scatters them,” reads John 10:11-12. Prime Minister Anastase Murekezi invoked this scripture to call upon the newly-consecrated bishop of Shyira Diocese, The Rev. Samuel Mugisha Mugiraneza, to be a real shepherd and always take care of the congregation to purposefully serve God. During the consecration of the bishop, the premier said Rwanda has had a lot of blessings and there is hope for more achievements. “Let this verse guide you to fulfill your clerical responsibilities, including preaching the God’s Gospel, healing injured souls and always help your flock live better lives,” the premier told the new bishop. He challenged Bishop Mugiraneza to always strive to sustain and advance the development activities undertaken by the Anglican church in the diocese, saying it is equally the bishop’s role to ensure the diocesans are not only spiritually nourished, but also physically lead a better life. 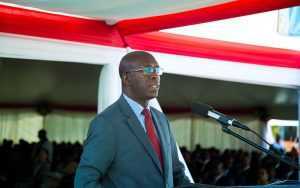 The premier said churches should always mobilize their Christians to better understand that their nuclear families are the foundation of faith and social fabric. “When families lack peace, safety, conviviality, togetherness, positive virtues and when they lack mutual respect, flexibility, complementarity and if we fail to raise our children well; we cannot sustain anything we do,” Murekezi said. The premier added that it was equally the duty of the church to encourage Christians to play a key role in promoting government programmes aiming at self-reliance and dignity. Some of such programmes which also complement Christian values are education, health, hygiene, agriculture and savings for the future, he said. The outgoing Bishop of Shyira Diocese, The Rev. Laurent Mbanda, said the diocese, with 66 parishes in four districts of Burera, Gakenke, Musanze and Nyabihu, has grown from 41,800 followers in 2011 to over 102,000 in 2016. The diocese, he said, offers education from nursery up to university level having over 15,000 children from 168 church-based early childhood development centres (ECD), with 2,700 students participating in nutritional feeding programme in 27 ECD centres. The diocese also operates 53 primary and secondary schools. Over 1,000 students are currently undergoing technical and professional skills at the church-run Muhabura Integrated Polytechnic College, Mbanda said. The diocese also boasts a health centre, a hotel and a commercial complex. It has also helped create over 800 savings groups with about 16,000 members. Mugiraneza, 46, was ordained deacon in 2000 and a priest in 2001. He served as sub dean of Saint Etienne Cathedral before he was assigned as pastor in charge of development in Shyira Diocese, a position he was serving until yesterday. During the Mass, Bishop Nathan Rusengo, of Cyangugu Diocese, preached about the wind that blows and tends to fell Christians, making them betray their savior. He prayed for God to bless and help the newly-consecrated bishop and his family to fight all the kinds of winds that can prevent them from fulfilling the task of being true servants of the Lord. Mugiraneza said he was overwhelmed with joy and hailed his parents who nurtured him spiritually and have fully supported him in his calling. “I wanted to be an engineer but God closed all the doors and led me to priesthood. I know that, together, we will achieve a lot,” he added. 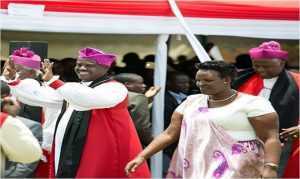 Bishop Mugiraneza will be serving a long bishop Mbanda until in 2018 when the latter will leave office.